There is a lot of research that high-intensity interval training (HIIT) workouts are some of the most effective exercises for PCOS weight loss. HIIT is fantastic for women with PCOS. It is one of the best PCOS exercises you can incorporate into your routine. The workouts are short but intense and keep your heart rate elevated. 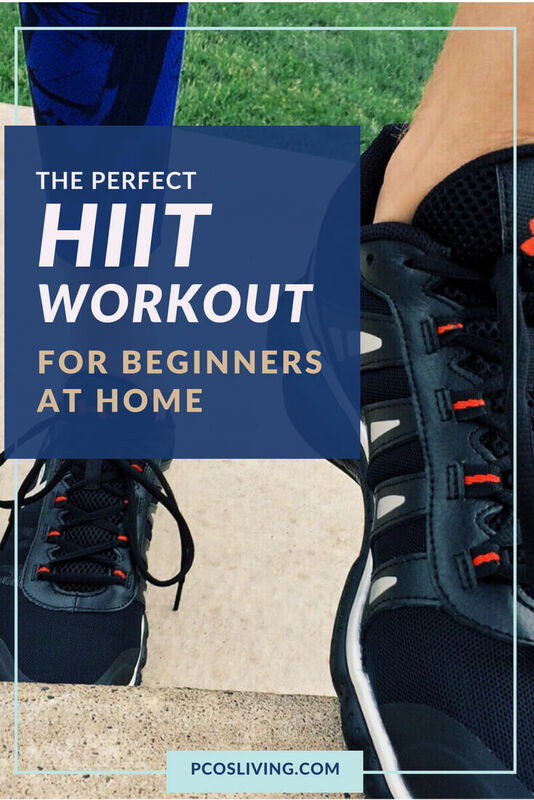 HIIT is also very convenient because you can do the workouts at home or in the gym. You don’t need any equipment and you can be done with your workout in 20 minutes. There is no reason to say that you can’t get your exercise in! High-intensity interval training or more commonly referred to as HIIT is short periods of intense anaerobic exercise with less intense recovery periods. It’s done at 85-100% of one’s maximum heart rate. HIIT is a type of cardio workout. The goal is to get and keep your heart up the whole time you are exercising. This PCOS exercise is short in duration but because you are working at a higher level of intensity you are getting the benefits in a shorter period of time compared to a longer traditional workout. HIIT involves doing exercises at a fast pace with a short recovery period. An example would be doing as many jumping jacks as you can for 20 seconds and then resting for 10 seconds. HIIT is by no means easy! It is a very challenging workout. If you are going to only do a quick workout, it has got to be intense. Ideally, PCOS workouts should be short and intense. Research like this study from UCSF indicates that shorter more intense (difficult) workouts do a better job of improving the metabolic problems associated with PCOS than longer moderate intensity workouts. The University of New England conducted a study looking at HIIT and insulin resistance in women with PCOS. Women over the age of 18 were either assigned to a HIIT group or a non-exercise group (the control) for 12 weeks. The results showed that women who participated in HIIT three times a week had significantly improved their VO2 max, peak power, and had reductions in waist and hip circumference. Why is HIIT so Effective for PCOS? High-intensity interval training promotes insulin sensitivity. Improving insulin sensitivity is vital for women with PCOS as 80% of women with PCOS are insulin resistant. This articles explains the best time to workout if you are insulin resistant. HIIT helps the glucose enter into the muscle cells. Your metabolism stays elevated after the workout and will continue to burn calories long after you are done exercising. This is due to the excess-post exercise oxygen consumption (EPOC) effect. If you are new to working out or trying HIIT for PCOS, here is a beginner’s routine that can do from the comfort of your own home. Here is how it works. You will go all out doing each exercise for 20 seconds and then you will have a 10 second rest before you start your next move. Once you have finished the round you will take a minute rest and start the entire set over again. Repeat for a total of 4 times and you will have a nice 20 minute workout. Looking for more help managing your PCOS? Check out my 7-day plan which includes a diet and exercise plan and tips on how to start losing weight with PCOS. Want More Help With Your Weight Loss Goals? Sign up and receive insider tips and tricks. Thank you! Make sure you add contact@pcosliving.com to your contacts. I would hate for you to miss out because it went to spam.